Last month, Creative Digital Solutions joined the EU Code week 2014 by organising a whole day of workshops in the Botley Primary School in Oxford. 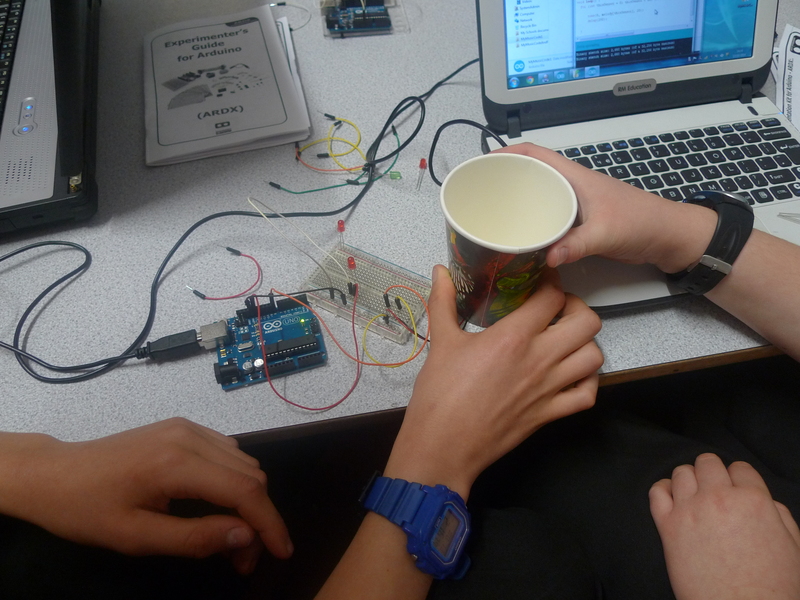 It wouldn’t have been possible without Year 2 teacher – Lizzy Hegarty – and all the other teachers who engaged with us on the day – although it was their first time with Arduinos, after a short introduction, they were immediately up to speed and helping their students. This is the first time that we worked with really young children – aged 6 and 7. Patricia had run the workshops many times before with students of all ages from 6 to 66. Yes, you can do much more with older kids in an hour, but what these young children achieved in just 45 minutes was amazing – they all managed to make 1-2 lights flash and change the code to play with the speed in which lights were flashing. And you should have seen these hugs, hurrays, and jumps when their LEDs flashed for the first time. With the older kids (Year 5-6) from the Code Club run by Peter Lister (thank you Peter for your great help on the day!) we obviously managed to do more, e.g. more complicated flash patterns… … and even music to go with it, with sound amplified by a cup: After the workshop parents kept on approaching with a question whether I had run a workshop with their kids. Apparently, many kids came back home telling about the workshop and how fun it was and how much they wanted to do electronics in the future (these children knew me because my son attends Botley Primary too, this is how their parents have found out about my involvement). Many of these kids were girls 🙂 The workshop was a big success not because of the number of flashing lights or the music made, but because we manage to show to very young kids that coding is fun and everyone can do it. This is the thank-you we received from school published in the school’s newsletter. Thank you!